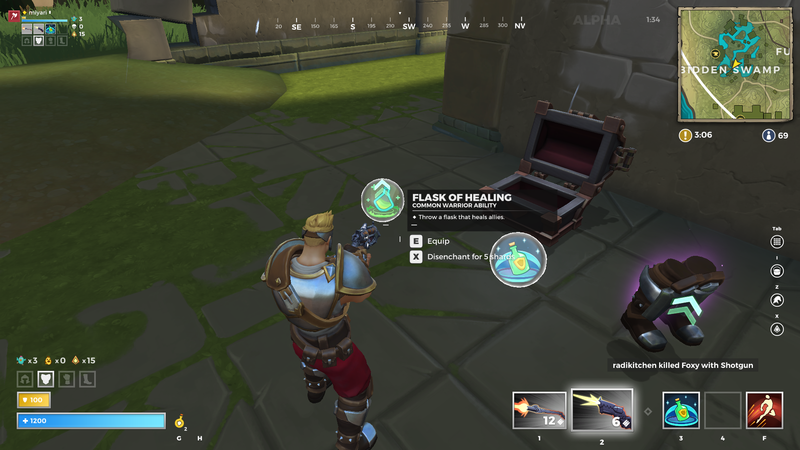 Realm Royale features many of same ingredients that players have come to expect from games in the battle royale genre. Much like Fortnite and PUBG, players start the match by being airdropped onto a sprawling map where, upon landing, the immediate hunt for weapons and armor begins. Players will fight solo or as part of a squad to defeat other players, collect the best loot, and, ultimately, come out on top as victorious (awarded as a “Crown Royale”). Where Realm Royale stands apart from its predecessors, however, is in its focus on class-based combat, offering players five different classes to choose from, selected at the start of the match. Each class features its own special abilities as well as a unique, Legendary quality weapon made with their best interests in mind. Once the match begins, there’s no swapping classes, and players are free to use whatever weapons and armor they may come across—the only gear limitation comes with the aforementioned Legendary weapons, which are unique to each class. In this guide, we’re detailing all of Realm Royale’s unique player abilities, which are a welcome addition to traditional battle royale gameplay. 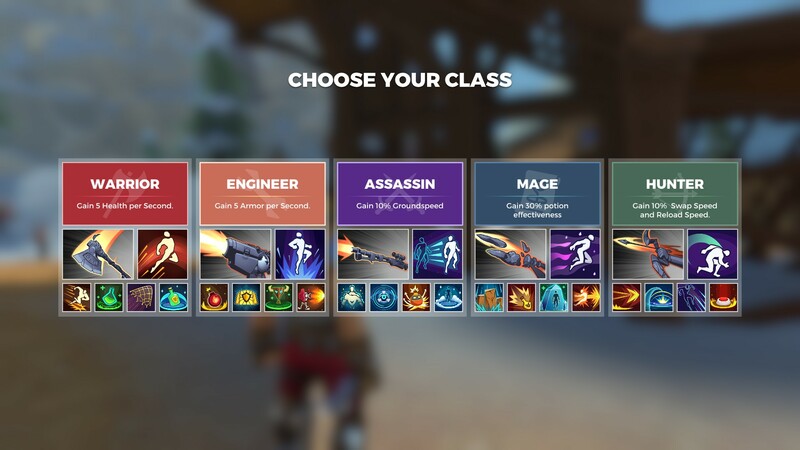 Each of Realm Royale’s five player classes have at total of five unique abilities and are able to equip a total of three at a time (including a movement ability, which can’t be changed). You’ll start the game with only the movement ability (bound to [F], by default) and should immediately begin hunting for combat abilities, which can drop from chests. Upon picking up an ability, it is automatically equipped in the first available slot (bound to , ), but the order can be swapped by opening the inventory menu ([I]) and clicking the “Swap” (the same goes for weapons, by the way). As with armor and weapons, abilities can be Disenchanted to receive Shards, necessary for crafting at a Forge. Also, Abilities will drop at different rarities, including Common, Rare, Epic and Legendary, allowing you to upgrade lower tier abilities with improved versions featuring shorter cooldowns and increased durations. Some abilities even receive a damage increase with higher rarity. You should have no problem obtaining your abilities relatively early in the game, as long as you manage to get your hands on a few chests. Legendary abilities can only be crafted (at random) by visiting a Forge, requiring 90 shards. If you defeat an enemy who is playing the same class as you, you can pick up any of their equipped abilities, which are dropped on death. Warrior: Gain 5 Health per Second. Engineer: Gain 5 Armor per Second. Mage: Gain 30% potion effectiveness. Hunter: Gain 10% Swap Speed and Reload Speed. These bonuses are all pretty straightforward and generally compliment the gameplay style you can expect from each role. The Hunter’s bonus is arguably the weakest, as it doesn’t synergize well with their Legendary weapon, the Longbow. The Longbow does not require reloading and once you get it, you probably won’t need to bother switching weapons very often, as it’s a great choice for both close and long range combat. As the game is still in Early Access, it’s likely we could see changes to these passives at some point. We've composed detailed guides for each class, offering a full breakdown of the numbers involved in their abilities and spotlighting each ability's strengths and weaknesses. Be sure to check them out so you can find your new favorite class in Realm Royale!